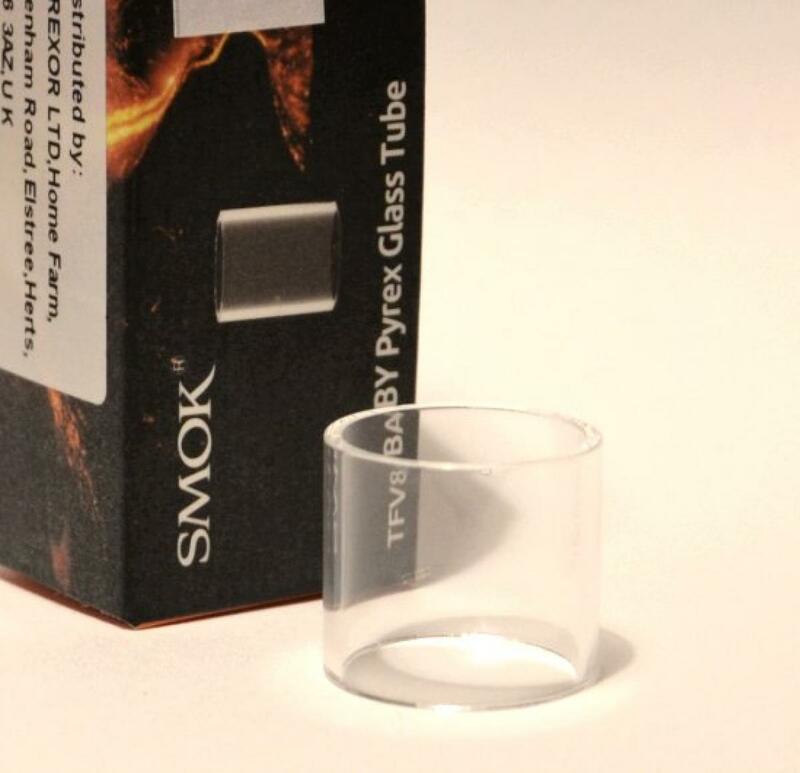 SMOK TFV8 Baby 3ml/2ml Pyrex Glass Tube | Electronic Cigarette Co.
Due to larger packaging requirements for this item, there is a postage charge of £2.50 unless you spend £20 or more, or select a premium delivery service during checkout. 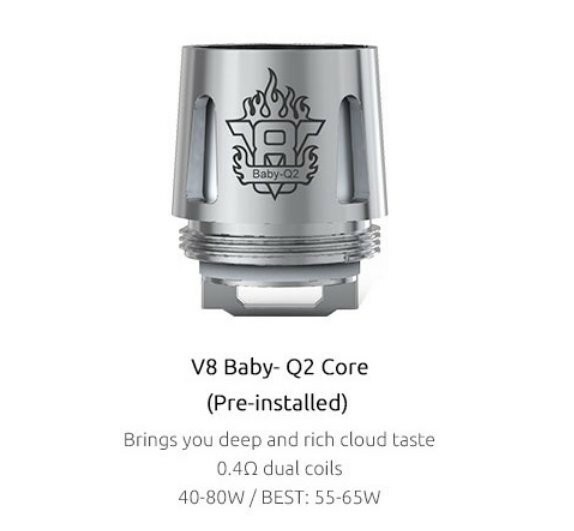 One replacement SMOK TFV8 Baby glass tube. Please check measurements before ordering. 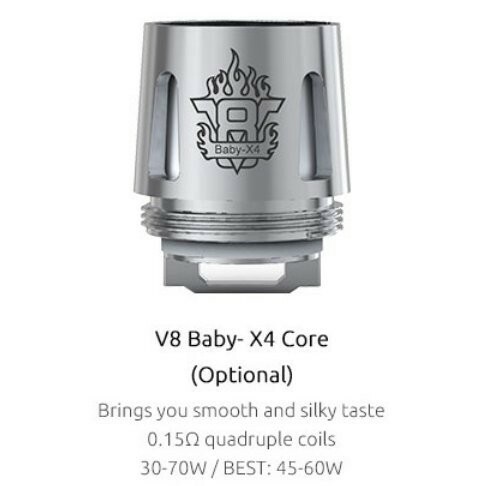 There's also a shorter glass for the TFV8 Baby tank (EU version). Authentic SMOK product but plain packaging because they come bubble-wrapped in bulk. 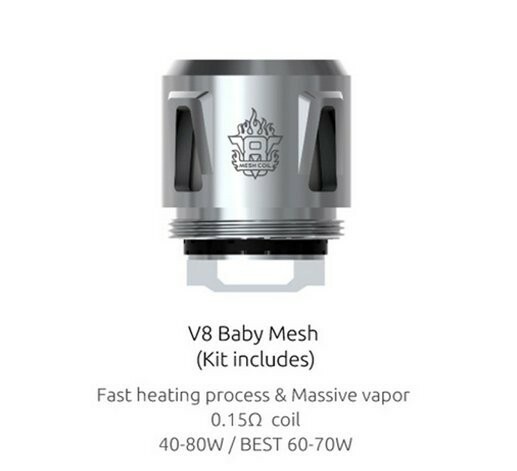 1 x SMOK TFV8 Baby Beast Glass Tube. Remember to clean your mouthpiece regularly to minimise the build up of bacteria and unwanted contamination of any kind. 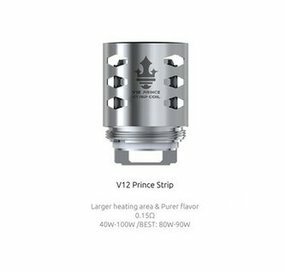 Users of electronic cigarettes must be very cautious when charging and using all types of rechargeable lithium-ion batteries and this includes built-in mod batteries. If misused, mistreated or mishandled, lithium-ion batteries pose a serious safety issue. Please familiarise yourself with best practice and play it safe. We will not be held responsible for damage if there is any modification of the batteries or chargers in any form. We are not responsible for any damage or injury caused by the misuse, mishandling or mistreatment of lithium-ion batteries and/or chargers. All lithium e-cig batteries need to have some charge in them to stay healthy, so they come part charged and ready to use. The first time you recharge your battery ensure you give it a full charge which could take 4-5 hours, depending on the battery. Don't overcharge the battery, when it's charged and the light on the charger indicates charged, remove the battery from the charger. Ensure you have a good quality charger. Always use the correct charger for the battery you are charging. Never leave batteries unattended while charging, unplug before you go to bed or go out. Don't charge batteries on combustible surfaces such as carpets or surfaces that could be damaged by heat. When the battery is fully charged unplug it. Ideally let the battery rest for a few hours after charging. Don't let the battery drain of power completely, it's recommended to recharge the battery when it is low on power, not totally empty. Don't leave the battery without any power at all when it's not in use - this can result in a less usable battery. Don't heat or incinerate batteries. If a battery becomes hot when you're charging it, stop charging immediately and let it cool down before you handle it further. If you're using a mod with removable batteries, the manufacturer often recommends that it is advisable to remove the batteries and to charge them separately, ie don't charge them in situ via the USB. Storing batteries properly extends the life of the battery and keeps them from becoming a safety hazard. Store batteries away from metal objects including items such as keys and coins (so avoid leaving them in your pocket). Store batteries in a dry, cool place which is not subjected to extremes of temperature or humidity. If you live in a hot location batteries can be stored in a refrigerator (but don’t freeze them). If you do this, you must seal them in an airtight plastic bag to maintain the right moisture level. When storing lithium batteries for a period of time, ideally leave them about 40% charged - this minimises degradation and allows the battery to slowly discharge itself, which is crucial for its operational health. Always store batteries with the positive and negative terminals away from each other so they can’t begin conducting electricity idly. Avoid storing new and old batteries together because there is a risk that the newer ones will conduct electricity into the older ones. Dispose of batteries safely and in accordance with regulations (this is likely to be a specific lithium-ion facility at a recycling centre). Good clean contact between your e-cig battery and clearomizer/tank is essential for the best heat, vapour and flavour, so regular cleaning is essential (every couple of weeks or so for example). Rubbing alcohol/surgical spirit on a Q tip/cotton bud is ideal. Clean the outside of the connection/contact area (for eGo batteries) and the inside too ensuring that you hold the battery upside down so gravity can take away any excess fluid. Paper towel can be used to dry the area if necessary. For stubborn grime a cocktail stick is ideal for the threaded grooves, taking care not to break it off inside the battery, but don’t use anything metal. Problems with batteries and charging - what can go wrong? Batteries are tested before they leave the manufacturer but this doesn’t mean there will never by a faulty battery in circulation. However, if you’re having problems with a battery (and it’s relatively new) there are other things to consider and eliminate. If you’ve purchased batteries from one source and chargers from another there may be a compatibility problem, ie a slight difference in the size of the battery thread and the tank device or, and this is much more serious, the charger may not be intended to charge your particular e-cig battery and there may be voltage issues and therefore a serious safety risk. Use special caution when working with e-cigarette batteries as they are very sensitive to charging characteristics and may overheat or explode if mishandled or misused. The user must ensure they have sufficient knowledge and take sufficient care in charging, discharging, assembly and storage. Healthy Start Ltd is not responsible for damage if there is any modification of the batteries or chargers nor is Healthy Start Ltd responsible for any damage caused by the misuse and/or mishandling of any batteries and chargers. Healthy Start Ltd will not be held responsible or liable for any injury, damage, or defect, permanent or temporary that may be caused by the improper use, due care and attention and storage of batteries.